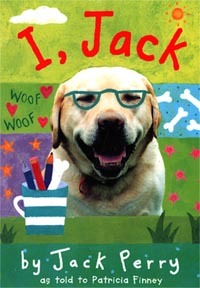 I am Jack, old-fashioned yellow Labrador. I am very very Thick. Thick means Good. "Jack and Rebel the Police Dog "
all about Me and My Pack and my friend Rebel. It's now available in all good bookshops. Look! You can do all this stuff! GO WALKIES round my Den! Visit my packlady at her website If you've emailed Jack or Patricia Finney in the last few months and not got a reply, many apologies, she has had trouble with her emails. Could you try again?